Here’s a little gem I recently uncovered. No date, no attribution, no name of the subject. It’s a little approximately 1/6 plate tintype. Definitely not from a professional studio, as the plate is ragged – the edges appear to have been almost torn from a bigger sheet, and the collodion pour and/or development are uneven. The photo was taken in the field (literally – you can see the grass under the sitter’s chair, and the backdrop looks like it might have been a rug or blanket with some kind of fringe on top, thrown over a hastily erected backdrop stand). Still, the photographer went to the effort to tint the cheeks on the sitter. It brings to mind the civil war soldier portraits with the young men about to march off to war posing with pistols. I wonder, like with those war portraits, if the pistols are indeed property of the subject or if they are merely props he chose to pose with because they looked cool (many of the civil war soldier photos are using prop weapons that belonged to the studios. Many soldiers had not yet been issued firearms when they had their pictures taken, and they often posed with weapons inappropriate to their rank and status – enlisted men with non-government issue pistols, for example). Was he a saloon keeper? A lawman? The guns are kind of dinky, and he’s handling them rather casually. I think it’s the aura of uncertainty that lingers with an image like this that makes it so fascinating. I’m using the term “Vernacular Photography” to describe this image. A good friend of mine gave me a definition for it (after a rather contentious debate from which I learned some humility): “Vernacular photography is photography by indigenous populations for indigenous consumption”. Meaning photographs that are created with the intent to be consumed by the audience that created them. The photographer does not have to be known or unknown; neither does the sitter. What matters is the intent. So a Mathew Brady portrait of a client off the street, commissioned by that client for their own personal use, even if the client were famous, would be vernacular, but Brady’s civil war documentary, even the camp scenes of soldiers at rest, would not. Diane Arbus’ photos are NOT vernacular, nor are Ansel Adams’. Their work was created for the express purpose of exposing an idea and sharing it with the world at large. Vernacular photography is created for a known, limited audience. Non-vernacular photography (art photography, documentary, etc) is created for an unknown, unlimited audience. 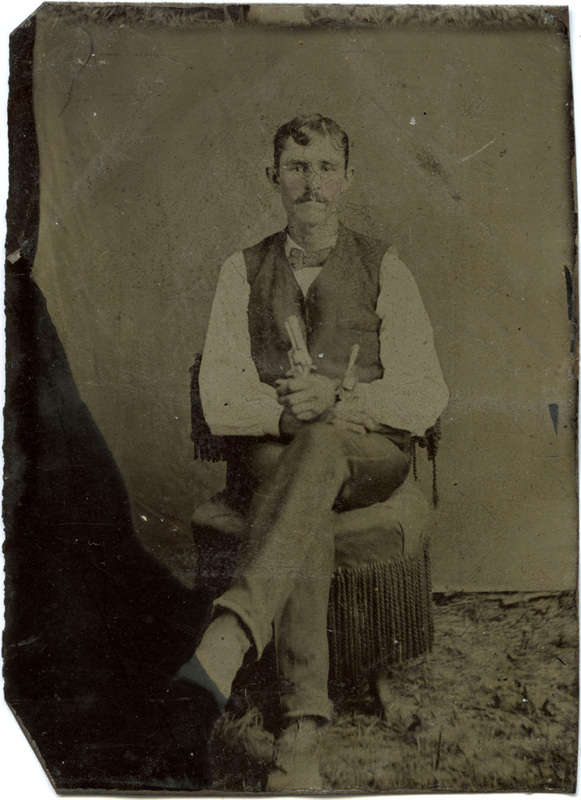 The sitter for my tintype here probably had no expectation of the life of his image beyond whoever he gave it to being able to remember a moment in time at some now-unrecorded location. By collecting it, publishing it and categorizing it, though, do I now lift it out of that category of vernacular image by giving it that unknown, infinite audience? There’s a wonderful book on the American Tintype by Steven Kasher called “America and the Tintype” which catalogs the better part of a century’s worth of mostly anonymous, vernacular photography from the tintype era. If you’re interested in the subject, I highly recommend picking up a copy.